I've been wanting to do a spread for Art Journal Journey (there is a music theme in April, "for the record"). 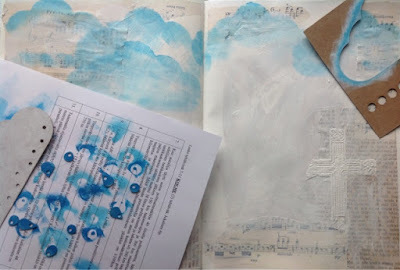 The other day the radio played "Another one bites the dust" -haven't heard that for ages... and it got me thinking about how many well known artists have passed away lately. 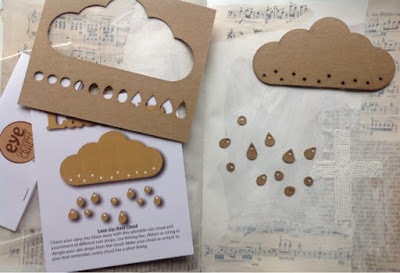 I remembered I had a chipboard cloud with raindrops in my stash, and so the idea for the spread was born :) I am also posting for the Paperartsy challenge (white space, I'm sorry I haven't had time to do several posts for that one!) 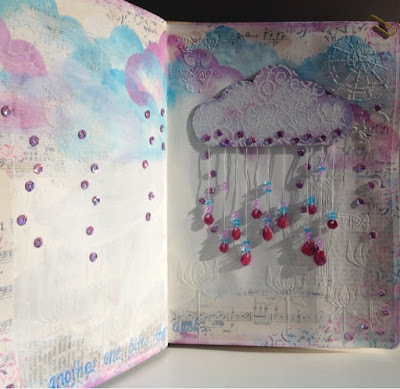 and the WOW challenge (anything with embossing goes). 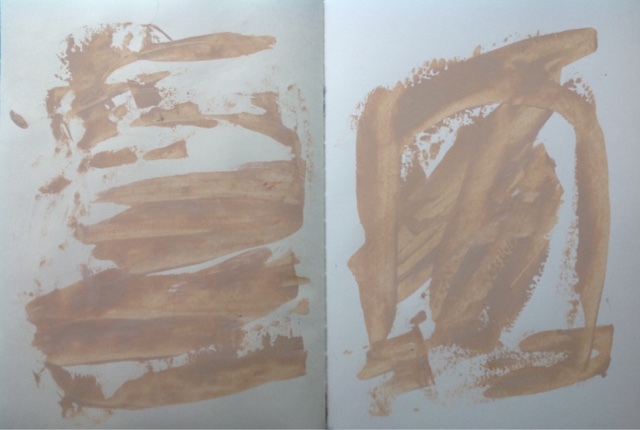 The old book page with a cross on it is a smudged experiment from a year ago. 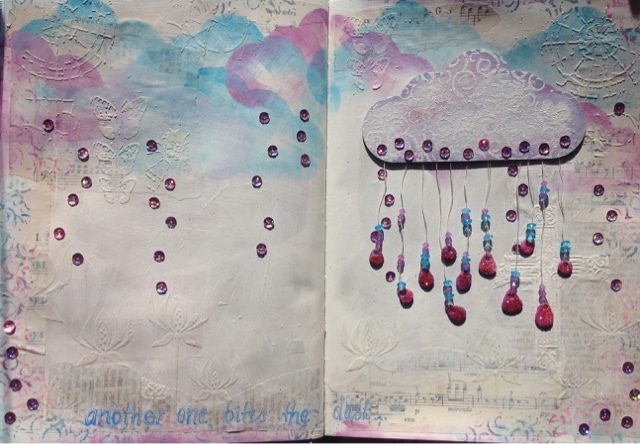 It fits well with the R.I.P theme :) I wanted some more texture on the page, so I stamped with a swirly background stamp from Rubber Dance on the edges of the spread and over the cloud. 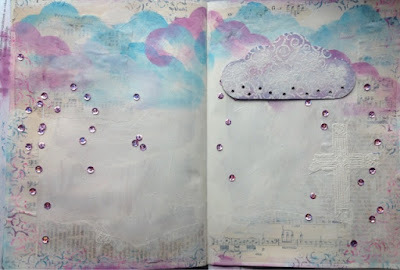 The stamping on the cloud was embossed with WOW Sparkling Snow. I found some light purple sequins to fit, and decided to cover the holes on the cloud and attach my raindrops with tape behind the cloud. This picture shows the lovely sparkle of my raindrops. 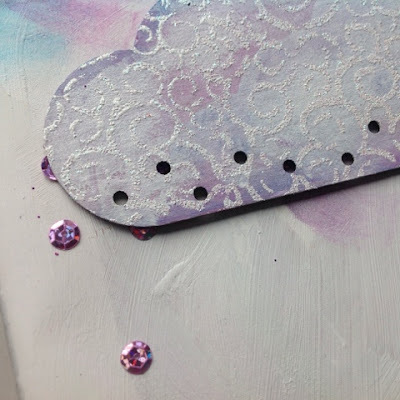 They have a layer of purple acrylic paint, purple glitter sprinkled on heavy gloss gel and covered with Crackle Accents (on both sides). 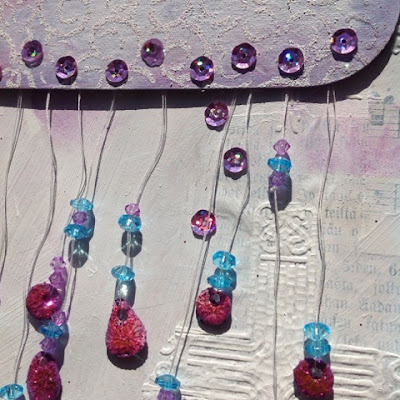 The glitter had dissolving colours that made the raindrops a bit reddish compared to what I had had in mind. 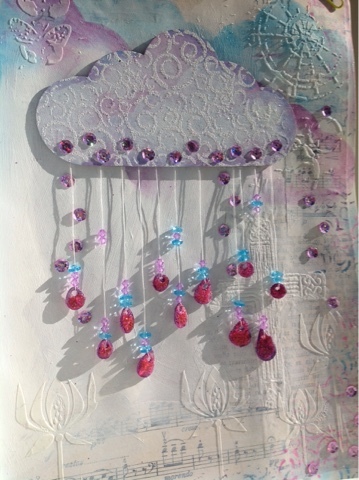 I added some plastic gems on the thread before attaching the drops to the cloud. My original idea was to write "Another one bites the dust" on the left page with large letters. 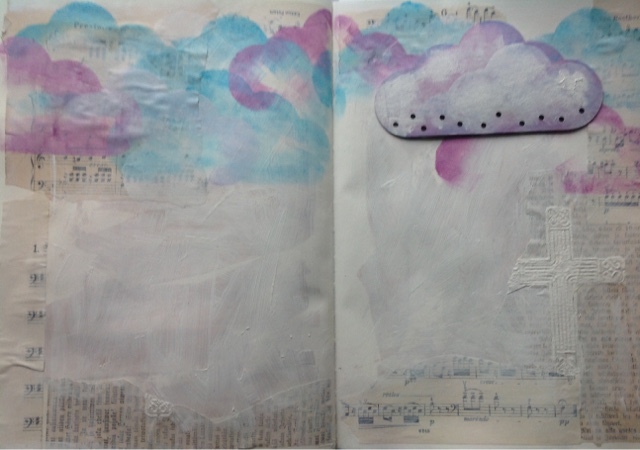 Since the colours turned out soft and hazy, I at some point thought to write "laughing in the purple rain" instead... but the white felt addictive, and I ended up adding white texture paste and writing the text at the bottom of the page. I took pictures on a really sunny day. This looks so cool when the book is upright, but the threads do get messed up easily! oh wow what a gorgeous page for this song!! Thanks so much for sharing the step outs and for joining in at AJJ! Such a fabulous and beautiful art journal page.